There's a shift in the way Canadian urbanites are choosing to traverse their cities. Many individuals, families and businesses are opting for a more active and cost effective mode of transportation; such as the bicycle. And to that end the cargo bike is gaining popularity. 5 years ago you would not have seen a cargo bike. Today, although still rare, you might actually come across a cargo bike parked in front of your local take out restaurant, daycare or zooming by with children, dogs and or groceries. It's so common to see cargo bikes in Europe (notably Denmark, Holland and Germany). It's starting to gain traction in Canada. Families are now faced with a new option of replacing their second car with a cargo bike. While many younger people are by passing the car all together and going directly to cargo bike ownership. Businesses are expanding their fleet with a more sustainable and cost effective solution. Individuals find that cargo bikes offer endless possibilities for personal use and for the potential entrepreneurial startups. After years of being at the fore front of the cargo bike movement in Canada and rigurously testing them at home or abroad, we have compiled a list of Canada's top cargo bikes. The most frequently used by Canadians as well as the most versatile & adaptable to our unique environment. If you are just starting to look at cargo bikes, prices may seem high, but remember that these bikes actually serve a purpose and will last for years to come. Best of all you can share the love of riding with someone; your copilot! The following is a list in no order of importance and purely based on our experience and feedback of others. We invite you to share your own feedback or thoughts on cargo bikes in Canada, especially if you own any of the mentioned brands. As well, the all new eBullitt with integrated Shimano StepS system is also available here. It has electronic shifting and high powered lights that can be controlled on the display panel. An interesting feature is the walk assist, should you ever need to push a heavy load around. If the battery dies out, no worries, because there is virtually no drag and therefoe you could continue biking as normal. Try one today! 2. Triobike Mono - The safest and lightest family cargo trike on the market! It comes from the "happiest" city in the world: Copenhagen. Triobike has been building and refining their unique design for over 10 years. Triobike first made its way to Vancouver in 2012 with Mikael Colville-Andersen from Copenhagenize , where Chris from Modacity had a first hand test of the Triobike Mono. In the past 4 years, the brand has become the popular choice for families in Montreal, Ottawa, Toronto, Winnipeg, Calgary, Vancouver Kelowna and Victoria. When it comes to safety, Triobike has taken the extra steps. The front box is like a giant helmet and has been continuously impact tested to maintain a high standard of quality and safety. The seats come with 5 point seatbelts. Most traditionnal trikes are very tippy, but Triobike includes a steering damper, cambered front wheels and a mechanism whereby the frame leans when you turn allowing it to be very stable. For Copenhagenites, the Triobike Mono might be their only family vehicule, but for many families in Canada, the Mono is the new "2nd car". What makes the Mono adaptable to our terrain? It is very lightweight with 8 internal gears which is good for hills, being a trike you do not need to worry about balancing your kids at an intersection surroudnded by cars. The components are internal, making it great for all wheather conditions. You also have a built in wheel lock for added security. At $4290.00 you get everything you need with a choice of a dozen colours for the seat and hood. In 2014 Triobike came out with their 2 wheel version known as the Cargo. There biggest seller being the Cargo S with Carbon Gates belt drive was a first of its kind for a cargo bike. At just 21kg this bike survived the ultimate test on a cross country journey from Montreal to Vancouver in Fall 2014 ridden by Lamar Timmins (find out more on Huffington Post). It is now present in most Canadian cities and used by companies like greatergoods.ca, maisonlegrand.com, Modacity and Bell events. 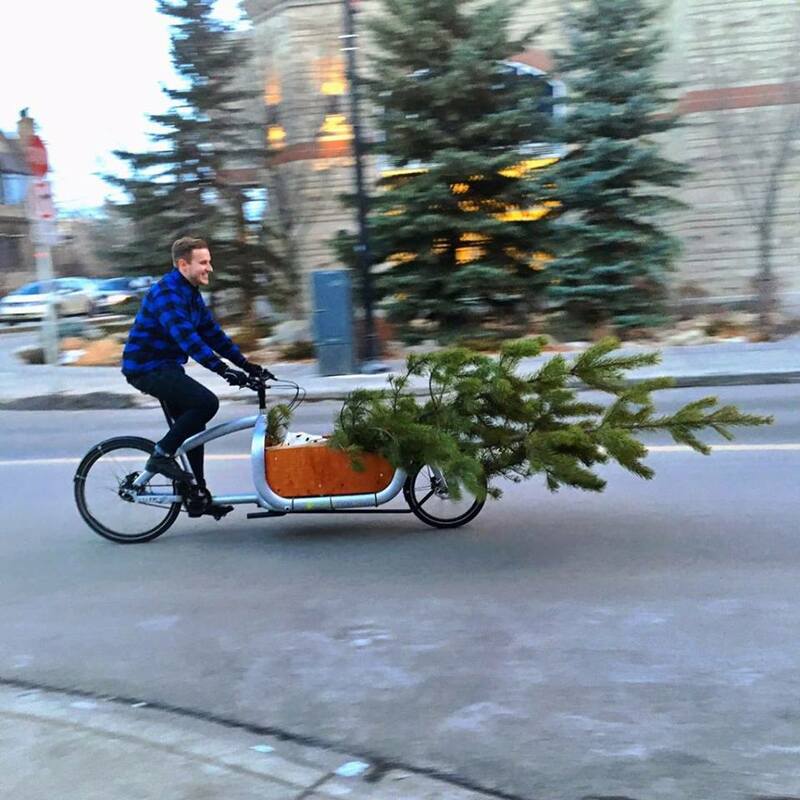 Strengths: Lightweight, stiff frame, work horse, good for hills and all seasons. 3. Butchers & Bicycles MK1 - New to the world of cargo bikes: the MK1. It has totally redefined the traditional trike. They call it a "tilt-action"cargo bike. The ability to bank; allowing you to take turns at a higher speed. It is another reason to love Danish cargo bikes brands! Its popularity sky rocketted in Europe. The MK1 comes at a higher price no doubt, but you are getting the ultimate riding experience. Any bike shop can maintain it. It is available with electric assist or carbon gates belt drive. Did we mention that the suspensions allows for a smoother ride? Especially in pothole ridden cities like Montreal, Ottawa or Toronto. A couple neat features are the lock box storage for your valuables or a bike lock. The front door, makes it easy for the little ones but grandma or even someone with reduced mobility can now enjoy the ride. The MK1-E is the ultimate machine. It has a built in BOSCH e-assist system allowing to reach upwards of 90kms on the easiest mode. It has been available in Canada for the past year with pre orders available for this year here. Strengths: Cannot tip over, fast turning, front door, different riding positions, good for hills and all seasons. 4. Nihola from Denmark offers a large variety of models for kid carrying to the mail delivery. Both Danish and German post have a fleet of Niholas for their daily mailing routes. It is one of the most recognized brands in Denmark today. Unlike traditional style cargo trikes like Christiania, Nihola has an independent steering linkage, allowing for a smoother riding experience. It comes with a well designed rain canopy and a front door. The upright riding position is good for added comfort. You can count on this trike to carry your heaviest loads. Price point starts at about $4000.00 with some Canadian dealers on the east side. Strengths: Independent steering, front door, large variety of models to ft your needs. 5. Babboe is a Dutch designed cargo bike that is both comfortable and affordable. They are widely available in Canada. The brand kept its Dutch influence with the nice wooden box, steel frame and upright riding position. The steel frame, although heavy, makes for a smoother ride, because it absorbs vibrations a lot better. While riding on our pothole roads, just imagine you are on a nice cobble stone road in the Netherlands. The step-through design allows for easy mounting and dismounting. They have both trike and 2 wheel versions. Posted on April 8, 2016 by velolifestyle.com.